City of Chicago Department of Transportation Commissioner Gabe Klein is resigning and his term at the helm of CDOT will end at the end of the month. While he only held the position for two and a half years, Commissioner Klein's direction and influence of Chicago's bicycle-related policies will extend far into the future. Klein successfully executed the incredibly successful Divvy bike-sharing program, oversaw the development of new bike lanes including more protected bike lanes, and will be leaving just as the dream of the Bloomingdale Trail is beginning to take off and become a reality. 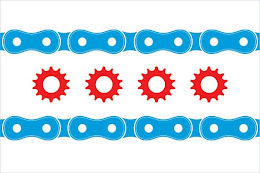 Included in Klein's successes is his steadfast commitment to bicycling as an integral part of a successful overall transportation plan for Chicago. The "Complete Streets" plan called for bicycles to be placed higher in the transportation hierarchy above automobiles and below only pedestrians and mass transit. Consistently, the "Bike 2015" plan continued under Klein's watch. The "Chicago Forward" plan, a two-year plan that began in 2012 called for the City of Chicago to implement transportation policies that would eliminate bicycle and pedestrian fatalities. The attorneys at Keating Law Offices are strong proponents of many of the facets of Commissioner Klein's vision for safe bicycling in Chicago, particularly those that call for the create or extension of dedicated bike lanes, especially protected bike lanes that separate bicycle traffic from motorized traffic. By their very nature, protected bike lanes reduce the opportunities for a collision between a bicycle and a motor vehicle thereby reducing the number of bicycle related accidents that result in injuries or death. "Commissioner Klein's commitment to the safety of Chicago's bicyclists is truly second to none. During his time at CDOT he was a true leader who had the vision and the passion to make real changes in the role of bicycling in Chicago. His ability to get things done, and his great sense of humor, will be greatly missed. We all thank him immensely for the work that he has done." Everyone at Keating Law Offices and the Illinois Bicycle Lawyers wish Gabe Klein and his family the best of luck with this transition into the future. Keating Law Offices, P.C. is the premiere personal injury firm in Illinois committed to representing injured bicyclists. Over the past five years, the Illinois Bicycle Lawyers at Keating Law Offices have emerged as national leaders in bicycle law. The firm has successfully represented hundreds of bicyclists in their claims for injuries.